Late 1940's vintage two tone afternoon pumps. White with black embroidered bird motif linen and solid black linen. 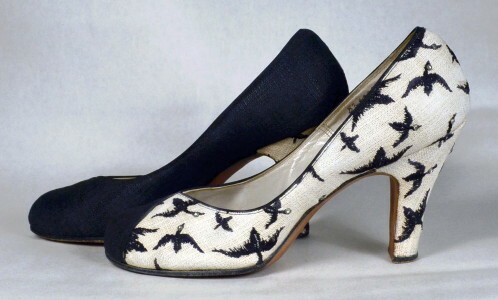 Bird motif covers outside upper and heels. Solid black linen wraps around inside upper to vamp crossing over toe. Bird eyes are studded with rhinestones. Rounded close toe. Black piping at throat. Closed shank & quarter. Boulevard heel. White leather liners. Interesting and unique pump from fine quality maker. EXCELLENT condition. Shows general age discolor throughout. Also shows moderate wear to liners & soles.